You might use the Forum for general question. This way the whole community benefits from your question and the answers. I’ll just want to say thank you for doing this. Thank you for spending time on this site. I really appreciate it. Thanks, thanks , thanks, thanks. Mark Knopfler is the single most skillful, most polished, most toneful guitarist in music history, and this incredibly comprehensive and informative website is a suiting tribute to him. As a lifelong fan, I have had the personal fortune and pleasure to see MK live in concert on numerous occasions, and I’ll say this much . . . when the world loses Mark Knopfler, it will have lost a rare and incredibly talented artisan – a true (once in a lifetime) “legend”. 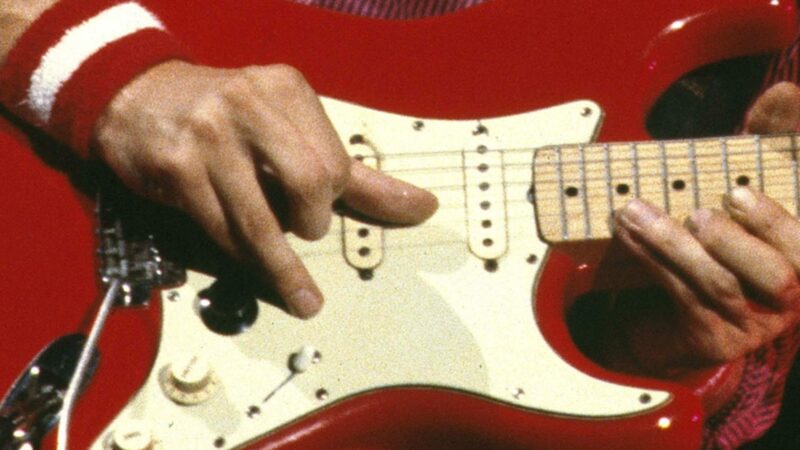 Thank you for this site, it’s great to go here to get some information and learn about this unique musician called Mark Knopfler… I want to tell you something about what I think is his guitar secret: his right hand. Oh, yes I know you all knew that, but, did you know that Mark Knopfler is left handed? Yes, and, if you think about it, he was meant to play the other way around, but I think it was his sister who told him when he was little that it was the other way around, so he started playing against his “nature” of left handed, so… my question for you is… have you ever tried to play the guitar the other way around? Your “strong hand”, (in my case is the right because I am right handed) becomes the hand that walk around the neck of the guitar, bending the strings and so forth, and the left hand, your “soft” hand, the one that is giving the beat, the strumming, the pase, so it would be more “gentle” with the hitting of the strings and your strong hand would be the one controlling the strings. Isn’t that what Mark does? To me, when he plays, I feel and see that his right hand is very gentle with the strings, very soft when he hits them, very elegant, and the left hand I feel that is very powerful and in control of what he does all the time, don’t you think? Best wishes to you Ingo, and thank you. Oh, by the way, Ingo, I sent you a personal request but I don’t know if you got it. I beg you to record a video tutorial of “Setting Me Up” to learn about the technique used in this song, is that possible? I think there are a few videos on this by different folks on youtube. I play many details probably differently than others, but then I cannot tell for sure if Mark played it like I do. I still plan to do more tutorials, and also on those ‘secret stuff’ but probably not for free. Do you know where I can get the complete and accurate tabs for Speedway at Nazareth? The generally available tab book does not capture the album outro after the first repeat. A couple of web sites have an inaccurate version. I am an amateur player and need all the help I can get for this fantastic piece of music. Sorry, no idea since I myself never use tabs, maybe others can help? and sound on all of that music. We so enjoy listening to all of your music. Isn’t that an Irish tin whistle? Thank you for your help with “In The Gallery” Would it be possible to send me a MP3 of the slowed down version in Am? We are a factory for musical instruments from china. Any interests please let me know. My guitar is now incredible and would no doubt have MK drooling with envy. I bought an upgrade from awesome-guitars.com for my SSS Strat. After installing the upgrade in my guitar (no soldering or body routing needed) I had 35 unique pickup tones, I stayed up all night playing it. I’m getting amazing tones from my upgraded Strat. Just can’t put this guitar down. It’s like being hooked on a tone drug. I have an HSS Strat that I will be upgrading with another of their upgrades. They recommend using asymmetric 4-wire humbucker pickups so I’m having my pickup guy make me one. The upgrade on this guitar will give me 88 pickup tones and true QuadraBucker pickup tones (i.e., putting all four pickup coils in series). This will easily give me pickup tones so fat, they’re obese. Hi – I am trying to find a whammy bar/tremolo bar for my Schecter Dream Machine. It should be brass as my tremolo is brass. I have also lost my brass back plate…duh. Any help would be appreciated. I live in the U.S.
Dear mr. Knopfler, I have a question for you. My father in law died and my mother in law wants to listen to a number of you on his cremation. She says the title is You and Me but we can’t find a number with that title? Can you maybe help me with this? Hello Ingo. I like so much sultans of swing l need the technique. I want to know. Dou you have a classes DVD for sale or you can give me classes foy skype cam.